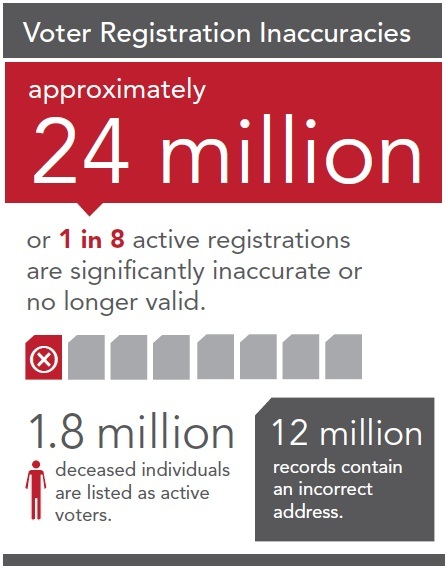 Pew’s Elections team continues its breathtaking pace of research, following recent reports on military and overseas voting and evidence-based election administration with a new study that finds one in eight voter registrations nationwide are inaccurate or out of date. Inaccurate, Costly and Inefficient: Evidence That America’s Voter Registration System Needs an Upgrade is a first-of-a-kind attempt to quantify the health of state and local voter rolls. • At least 51 million eligible citizens remain unregistered–more than 24 percent of the eligible population. •	comparing registration lists with other data sources, such as motor vehicle and National Change of Address records, to broaden the base of information used to update and verify voter rolls. Already eight states – Colorado, Delaware, Maryland, Nevada, Oregon, Utah, Virginia and Washington – have signed on to participate. It’s a huge leap forward – but the numbers in Pew’s new study suggest that the gap to close is big enough that bold action is required. This study – and the follow-on work – could literally transform election administration in the United States. If nothing else, bookmark the report for future reference; you’ll definitely be hearing about it again. Be the first to comment on "One in Eight Voter Registrations Nationwide Inaccurate, Out-of-Date, Pew Finds"